Cardcloud, formerly known as My Name Is E, is today – finally – launching an Android application. 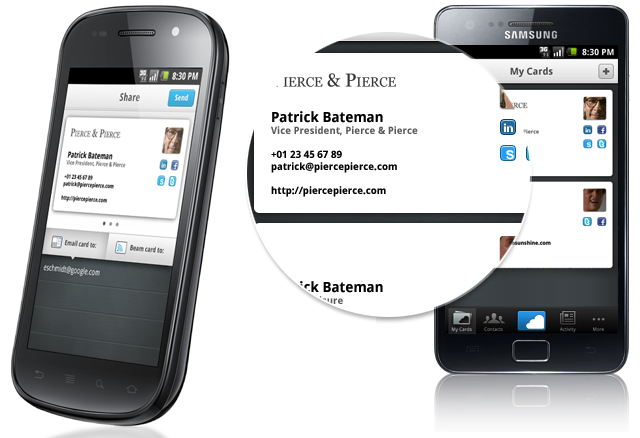 Cardcloud for Android basically allows users to create and exchange an unlimited amount of online business cards. Interestingly, recipients do not need to have any apps installed on their phones, as Cardcloud users can send their contact details and whatnot directly to an email address. Needless to say, that makes Cardcloud a great alternative for exchanging traditional business cards. Users can rapidly share (“beam”) their Cardcloud cards with people who do have the app installed on their phone, and the service works across different platforms (which, in Cardcloud’s case, means iPhone to Android and vice versa is possible). Cardcloud cards contain the contact information you’d typically find on paper business cards, but can also include links to social networking accounts, an up-to-date profile picture, geolocation information and notes. Also included is a vCard for fast storage on a local device or service. For alternative or similar services, check out Bump, SnapDat, CardFlick and CloudContacts.